The Adventures of Faith: Whaddaya mean I can't recycle my dead animals? 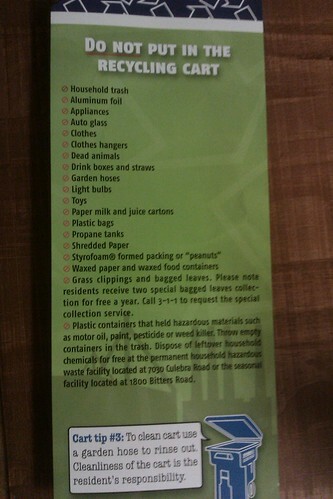 We got this door hanger from the city yesterday explaining what you can and can't put in the recycling bins. For some reason dead animals in the do not recycle list just jumped out at me. People would really do that? To think I used to think it was creepy when my dad talked about having the family dog stuffed so his grandkids could play with the same dog his kids did. Don't worry. We didn't actually have that done. He was cremated and his ashes are now in storage somewhere. The "Dead Animals" bullet made me LOL in the office. Awkward! Maybe they don't want people putting their dead budgies and hamsters in the bin? Regardless, hilarious! Maybe they meant like a dead raccoon or something??? Matt put a dead snake in the trash the other day. I refused to take it out that night!